Prepare! Map out where you want to go and look at the options for getting from one place to another. One of the things I like best about living in Bangkok is how many choices you have: you can take the subway, the skytrain, the airport link, a taxi, a motorbike taxi, the river taxi, the bus, a van… As a tourist, however, I would probably stick to the skytrain, the subway, taxis and at least one ride on a river (actually very stinky canal) taxi. As much as possible, have a general idea of where you are and where you’re going. Just this morning I ran into a group of tourists who had been dropped off by a taxi nowhere close to where they had asked to go. If you’re staying at a hotel and need a taxi, ask someone at reception to tell the taxi exactly where you need to go. Most taxi drivers in Bangkok don’t speak English; pair that with your being in an unfamiliar place and taxi drivers who don’t like to admit they don’t know where they’re going and you could be in trouble, i.e., late for your bike around Bangkok tour. SIM cards are easy to get in Bangkok, so get one and get some data so you can track your location. A note about taxis: Most of the taxi drivers I’ve had in the last 6 ½ years have been fine. They know where to go and they listen to me if I want them to go a certain way. However, I have had at least one drunk taxi driver and several extremely rude taxi drivers, so though these ones are in the minority, they can really ruin your day. I would just caution you and again tell you to ask someone at your hotel to help you get a taxi and tell the driver where to go. Also, taxis in Thailand are required to use a meter, but taxi drivers in tourist areas sometimes name an inflated price after you tell them where you want to go. There are enough drivers who use their meters that you won’t have to wait long for a new taxi. Take the train, take the train, take the train. 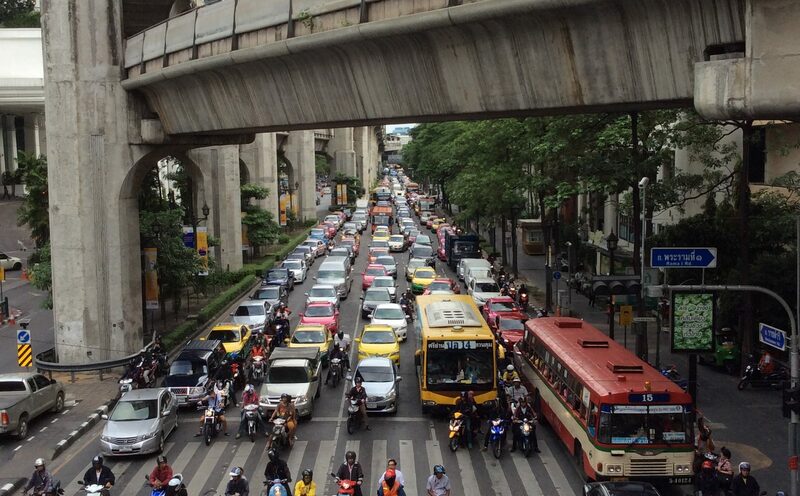 Bangkok is notorious for its traffic and rightfully so. Traffic is obviously worst during rush hours, which are roughly between 6:30-9:00 AM and 5:00-8:00 PM Monday through Friday. I take the train whenever possible, but when the train can’t take me where I want to go, I take a taxi, and then only on Saturday mornings and afternoons and on Sundays. Bangkok has three electric trains: the BTS (skytrain), the MRT (subway) and the airport rail link. The BTS has two lines: the Sukhumvit line and the Silom line, which connect at Siam station (incidentally the busiest BTS station). The Sukhumvit line primarily runs along Sukhumvit Road, which I consider to be Bangkok’s most important road and where I would stay if I was a Bangkok tourist. The Silom line crosses the Chao Phraya River so is useful when visiting the Grand Palace, Wat Arun and Wat Pho. The MRT also has two lines, the blue line and the purple line. 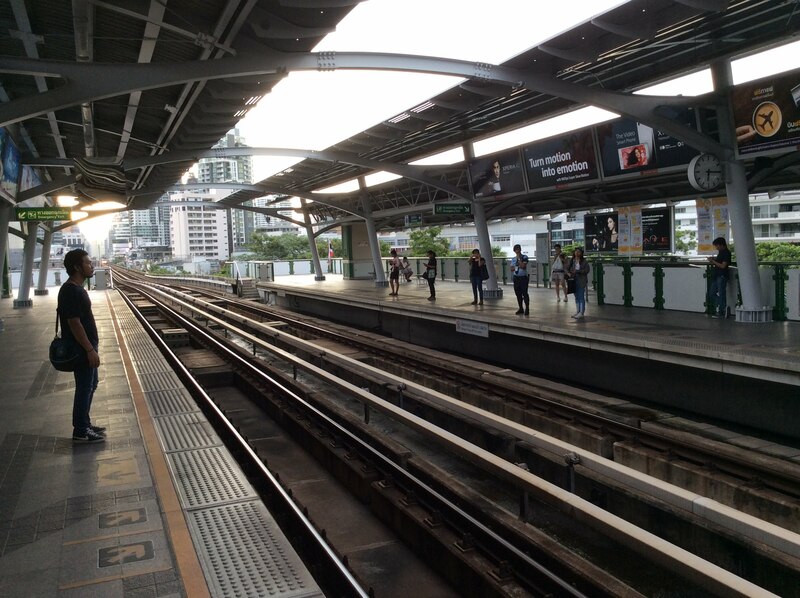 The blue line connects to the BTS’ Sukhumvit line at Chatuchak Park station, Sukhumvit station (generally the MRT’s busiest station) and Silom station. The purple line runs to the northwest of the city and so is not useful for tourists. The airport link runs directly west from Suvarnabhumi ( pronounced Suh wah nuh poom) Airport, Bangkok’s main aiport, to Phaya Thai, where it connects with the BTS’ Sukhumvit line. None of these trains have any kind of tourist card or pass, so just buy the tokens as needed. On the escalators, stand on the right and walk on the left. When you get on the train, go inside as much as you can, especially when the train is crowded. Rush hour on the road is also rush hour on the train and, if you’re standing in front of the door, you might be shoved further into the train even when there is no room by riders desperate to get on (people behind you in line will often dash onto the train if they feel like there is still room, which there often isn’t). 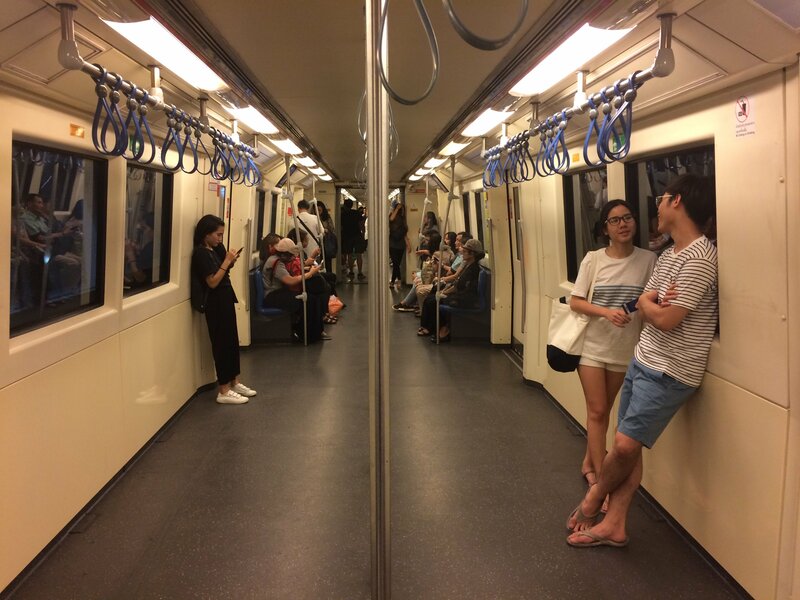 Having luggage makes a packed train ride more uncomfortable and unless you’re on the airport link, the other riders won’t be thrilled, so be as considerate as possible. If you’re standing in front of the doors when the train stops, get off the train and stand to the side to allow riders to exit the train. Even if the train is packed, it is still pretty quiet, so don’t talk or laugh loudly. If you have a backpack, wear it on your front instead of your back so you don’t hit other riders with it. Be aware that the seats on the end are generally reserved for elderly people, monks, handicapped people, pregnant women and children (yes, children). If these seats are open, it’s ok to sit there, but if any of the aforementioned people get on the train, offer them your seat. The bottom line about taking the train is to be aware of those around you. Walk when possible, but watch your step. Walking is a great way to get around Bangkok when you want to explore or when you’re heading somewhere not far from where you are. Walking is really the best way to see the city, but it can be a little dangerous. Motorbikes often like to join pedestrians on the sidewalk and the sidewalks are the worst my parents, who have been to more than 50 countries, have ever seen. The sidewalks are often uneven and their cement tiles are often broken. You are also competing for the sidewalk with food vendors’ carts, tables and chairs. This is not a place to walk looking down at your phone. Better to look down at the ground instead. Also, be aware that crosswalks (zebra crossings) are usually ignored by drivers in Bangkok. When you are waiting to cross the street at a crosswalk, never assume the drivers will stop. Take the river taxi at least once. As I recommended above, don’t miss the river (very stinky canal) taxi. 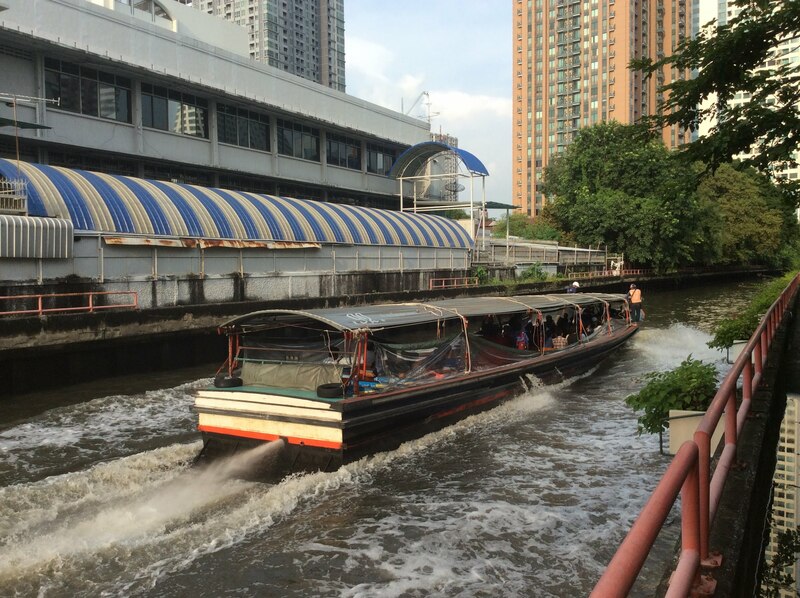 This is formally called the Khlong Saen Saep Express Boat and is the most interesting way to travel in Bangkok, which has been referred to as the Venice of the East because of its many canals. A ride on the river taxi won’t cost you much and there’s no traffic. Make sure you board quickly though as the boat sometimes doesn’t stop very long. Also, there are tarps on the sides of the boat that can be pulled up to protect you from the water. I’ve heard that if you fall in, you better go straight to the hospital. Take a tuktuk ride around Chinatown and don’t take a tuktuk again. 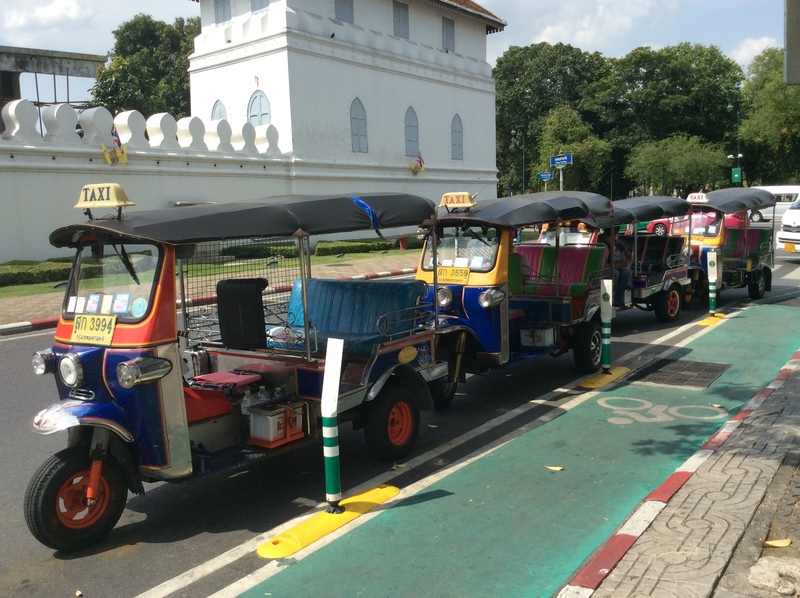 You have to take a tuktuk in Bangkok, but they are uncomfortable and overpriced, so one ride is all you need. Don’t rent a motorbike. When I hear that a friend is in the hospital, my first question is, “Motorbike accident?” If you really want to rent a motorbike, do it outside of Bangkok and wear a helmet. If you have any questions or comments, please leave them below and enjoy your time in Bangkok! Thanks, Aunt Kathleen! Sorry to hear you’re not feeling well. May God completely heal you. We won’t be coming to the US yet, but will need to in the next couple of years. Appreciate you reading my blog! O’ve been here 7 years. I LOVE the Grab Taxi app. You can set it to charge your credit card or cash.